Originating in Florida, childhood friends Ronnie Winter, Thomas Amason, and Duke Kitchens started the band while attending an AP music theory class, in 2001. The Red Jumpsuit Apparatus was officially formed in 2003 after the addition of other members that were currently in other bands. 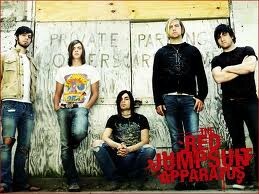 The band name, 'Red Jumpsuit Apparatus', was chosen by the band voting for random words they threw on a wall. The Red Jumpsuit Apparatus released a "6 song EP CD that was spread throughout different cities to promote the band in 2005". The band also began to become more popular as they used certain social media (Myspace) to advertise their music. While popular in their local scene, the band found it difficult to secure label support. This is why the band had taken time to write songs for a "period of 18 months before they went into the live scene." As they continued to increase live shows and performances, Red Jumpsuits' fan base continued to build to an almost unheard-of level for a local band. This escalating fan base attracted Jason Flom of Virgin Records in 2005 where they then started to work on their first debut album.